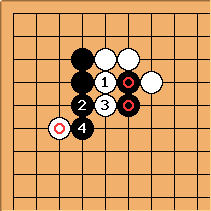 Various kinds of good play could be described as dodging the opponent's attack. 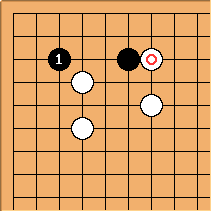 When White plays , it is part of natural good feeling for the game to invade the corner with . If Black can live this way, it isn't necessary to fight on the outside too. 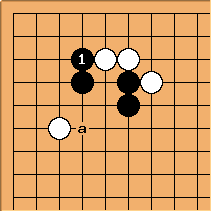 is considered correct here (Black a is the play from old Chinese games, used recently by Yamashita Keigo). But what if White tries to cut? See also the dropping back page. Further aspects of dodging are the whole topics of sabaki and flexible play.